As publications evolve, so do their methods of distribution. 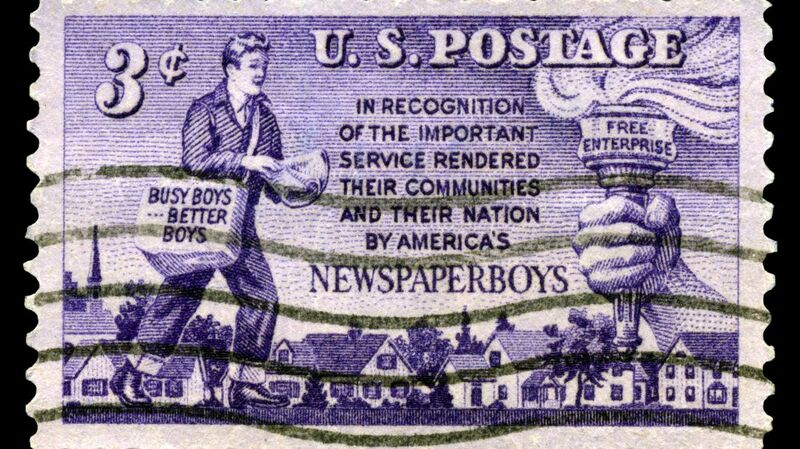 Between the rise of suburbs and the fall of afternoon daily newspapers, many countries teemed with youthful paperboys and papergirls. But thanks to shifting trends, most print media deliverers are now adults. This year, October 13 is International Newspaper Carrier Day, and we're taking a look at some of the most influential people who’ve ever worked a paper route, including a vice president, an astronaut, a supermodel, and the star of Risky Business. "Read all about 'em!" "When I was 9, my brother Roy and I were already businessmen," Walt Disney reminisced of his childhood. In July 1911, their father, Elias, acquired a sizable newspaper delivery route from the Kansas City Star. Although this route officially belonged to Roy, Elias took charge of its operation. Together, Walt, Roy, and Elias Disney were responsible for delivering the Star's afternoon and Sunday editions to over 600 customers. And that was only part of the Disney trio's workload: Every morning, they'd dole out around 700 copies of the Kansas City Times. Growing up, King earned spending money by working as a paperboy for the Atlanta Journal-Constitution. He landed the gig with some help from his father and frequently used his newspaper funds to purchase books. At age 13, the future Civil Rights hero became the youngest person to assistant manage one of the AJC's delivery stations. Four years later, King—then a sophomore—wrote a passionate letter to the editor of the same publication condemning the historic mistreatment of African Americans. His father would subsequently write that he had "no intimation of [King, Jr.'s] developing greatness" until the publication of said letter, "which received widespread and favorable comment." America's 47th vice president used a childhood paper route to hone his people skills—and work on his speech mechanics. Biden had a noticeable stutter as a boy (some classmates in a prep school Latin course took to calling him "Joe Impedimenta"). In 1955, his family relocated to Mayfield, Delaware, and Biden got himself a paper route shortly thereafter. The job presented him with a lingual challenge at first. "I lived in dread of Saturday mornings when I had to go collect [money] from people I was just getting to know," Biden has said. To make small talk with his assigned subscribers go smoothly, young Biden "learned to anticipate the conversation to come." Then he'd rehearse some sentences that might prove useful in the discussion. "My next-door neighbor was a big Yankees fan, and I'd always check the Yankee box score, because I knew he'd ask, and I knew I'd have to say something [about the team] without making a fool of myself," Biden recalled in his autobiography. "I had played out the entire conversation before he opened his front door." Inducted into the Naismith Memorial Basketball Hall of Fame in 1990, Monroe was a prolific scorer who spent 13 seasons in the NBA and helped the New York Knicks win their most recent world championship in 1973. (His number, 15, has been retired by the team and now hangs in the rafters at Madison Square Garden.) A native Philadelphian, Monroe entered the newspaper carrier game with some parental help. "In junior high, I had a paper route that my mother [Rose] and I built up until it was profitable," wrote Monroe in his autobiography. On deliveries, the teen would often be accompanied by his mom. "[She] did everything to help me when I was growing up," Monroe said. "She really didn't want me being out there by myself." Kathy Ireland was one of the most recognizable supermodels of the 1980s, posing for Sports Illustrated on several occasions before launching what turned into a global licensing company valued at $2 billion. Her success in the business world was foreshadowed by a historic newspaper-delivering stint. Ireland was raised in Santa Barbara, California, where—at age 4—she used to sell hand-painted rocks. When she was about 10, an advertisement calling for new paperboys appeared in one of the local newspapers. "Are you the boy for the job?" it asked. Young Ireland responded by writing a pointed letter to the editor. "No, I'm not the boy for the job, I'm the girl for the job, and I can do it just as well as any boy," she declared. "I think I deserve a chance." And she got one: Ireland became Santa Barbara's first-ever papergirl. By the time she retired from that gig, the budding mogul had made 120,000 newspaper deliveries and was voted her district's carrier of the year for three consecutive years. Long before he became synonymous with Hollywood road comedies, Leslie Townes "Bob" Hope was helping to support his family as a Cleveland paperboy. He later returned to the job while struggling to break into the entertainment industry. "At 8, I had a paper route. At 12, I worked in my brother's butcher shop. At 18, I was out on the road singing and dancing and at 19, I was back on my paper route," Hope wryly noted. Selling newspapers from street corners was another revenue stream for the aspiring performer. While working at his stand on 102nd Street in Cleveland, Hope managed to brush shoulders with the highest of high-rollers. "I had one regular customer whose name I didn't know; all I knew was that he snapped his face open and shut like a wrinkled old coin purse," explained the comedian. One day, the mystery patron needed change for a dime, so Hope ran across the street to procure some pennies from a local department store. According to Hope, "When I came back, my customer said, 'Young man, I’m going to give you some advice. If you want to succeed in business, trust nobody. Never give credit and always keep the change on hand. That way, you won't miss any customers while you're going for it." A few moments later, a passing inspector came up to the stand and asked, "Do you know who that man was?" "No," replied Hope. "He's only the richest man in the world,'" announced the inspector. "That's John D. Rockefeller, Senior." The author of over 40 books which together sold upwards of 75 million copies, Michener is best remembered for Tales of the South Pacific. Inspired by his service in the United States Navy, the novel won the 1948 Pulitzer Prize and was later adapted into the popular Rodgers and Hammerstein musical South Pacific. But long before his travels, a young Michener was an enthusiastic paperboy from seventh through twelfth grade. Working in his childhood home of Doylestown, Pennsylvania, Michener distributed various Philadelphia-based newspapers along five different routes. "I can still remember the residents of certain entire streets that I had served the longest," he wrote in 1992. "My paper routes gave me an insight into the complexity of life in a small town that not many boys acquired." Raised in a less-than-affluent household, Cruise turned to newspaper-carrying as a means of picking up extra cash. (He also raked lawns and put in some time at an ice cream parlor.) "When I was 13," the actor told Sports Illustrated, "I had a paper route and paid $50 for my first go-cart, $75 for my first motorcycle." To help meet his delivery schedule, Cruise enlisted the aid of his younger sister, Cass. "I always told her I'd pay her back. I bought her a car after Risky Business." He's the third-richest man in the world, with an estimated net worth of $91.5 billion, and Buffett's remarkable investment acumen has earned the Nebraskan the nickname "Oracle of Omaha." But the self-made billionaire got his start distributing newspapers on behalf of the Washington Post and other publications. "You had to deliver [them] every day, including Christmas Day," Buffett has said, adding that on Christmas morning, his "family would have to wait until I had done my paper route" before the festivities could start. At age 14, Buffett filed his first tax return, which reported that in 1944 he'd earned the equivalent of $8221 in modern U.S. dollars. And, given the nature of his job, the youngster knew he was able to write off the cost of his watch and various bicycle repairs as business expenses. Auteur director David Lynch was so low on personal funds during the production of Eraserhead (1977) that he needed a couple of side hustles to make ends meet. In addition to working a part-time plumbing job, Lynch delivered copies of The Wall Street Journal. "I built three sheds in my back yard during that period," he claims. "They were made out of wood I found on my paper route. My route took me through two different trash areas. On trash nights, my route would take two hours instead of one because I stopped and sorted through the garbage." Hey, everyone needs a hobby.